Hosier Lane, which is perhaps the most well known Street Art location in Melbourne, is the final stop on this tour. A quick walk from Centre Place and across the road from Fed Square, this space is, once again, covered in street art and graffiti. This Lane, like the others you have visited on this tour, is constantly changing; what is there one day could be completely covered with something new the next. To some this seems unfortunate, as they believe amazing art shouldn't be created over the top of, but this is the nature of street art and graffiti. The irony of Centre Place follows you to Hosier Lane, which is now a major tourist attraction and advertising tool used by the city of Melbourne. It is almost unbelievable how Melbournians have gone from being scandalised by graffiti, to accepting it as a part of our culture, and from there encouraging it to be used as a ploy to invite visitors into the city. It should be said that some graffiti and street artists do encourage this commercialization. 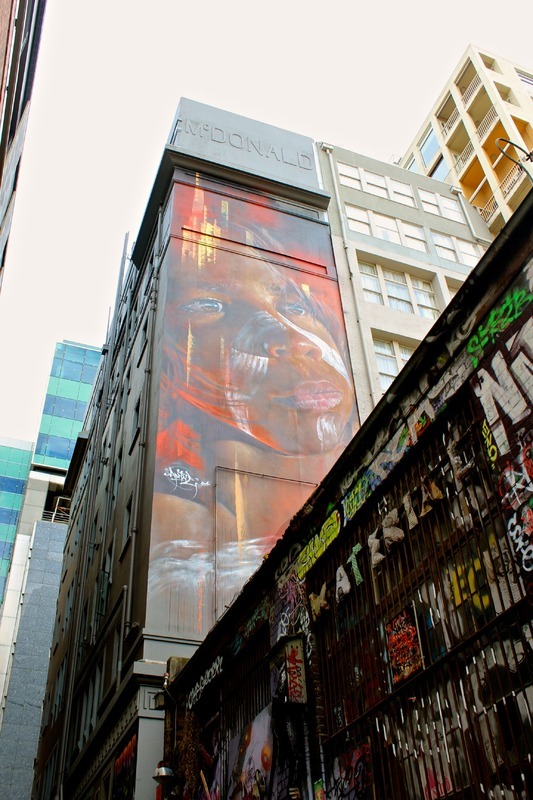 One particular example is Adnate's huge aboriginal mural in Hosier Lane. Commissioned by Hosier Inc to create this 20 metre high spectacle, Adnate has been able to legally create a piece that will be protected, and so is more art that graffiti. As in Union Lane, you should take your time here. There are hundreds, if not thousands of pieces to see, and not all of them are just paint! Here you might encounter "Yarnbombs", paste ups, sculptures or any number of other pieces. Go up to them, look closely, feel the textures - its all apart of the street art and graffiti tour experience. How ironic is it that this tour has discussed the commercialization of graffiti and street art culture, and yet tourism is one of the ways in which this culture has become commercialized? “Hosier Lane,” Street Art deTours, accessed April 24, 2019, http://streetartdetours.com/document/1103.